Qumran has never ceased to interest not only specialists, but a larger public as well, who are intrigued by the discovery of the Dead Sea manuscripts. An Italian company has had the idea of producing a documentary on the newest researches on Qumran which is to be distributed in various countries. The École Biblique has been the heart of Qumran researches ever since the first discovery and the work of Fr. Roland de Vaux on the excavations and publications. At the École, work is still in progress, mainly in the archaeological field, but also on a new edition of the manuscripts. Marcello Fidanzo who is a professor at the theology faculty of Lugano and a research associate researcher at the École, has been asked to serve as a consultant for the scientific content of this documentary. The documentary is about the new researches: the fresh excavations of the cemetery with an investigation of the skeletons, a reexamination of the caves, and a reconstruction of the manuscripts with the help of new technologies. The authors of the documentary were quick to understand that there can be no research that does not take account of the history of research. 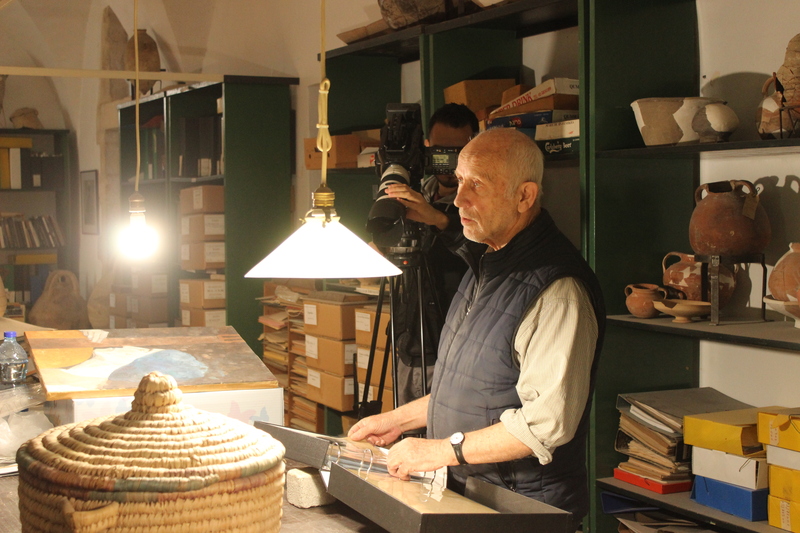 The École keeps the archives of the excavations and also has a team of researchers who led the field for many years. This documentary gives us the opportunity to evoke the history of the École and to show the work that has been achieved with reference to the projects now being published: the volume on the archeology of the School that was published in 2016 and that on cave 11Q which is in press. In the course of the excavation of the cemetery, a grave of a different size and form from the others caught the attention of the archaeologists. The analysis of more than sixty skeletons gave a consistent profile: these were adult men many of whom were suffering from an illness of the ear caused by frequent contact with water. Some parallels and explanations are looked for: for the digger, the grave could belong to an important member of the comunity that lived at Qumran; for the anthropologist, the only parallel with the Qumran skeletons is to be found in the Judean desert monasteries. The observation fit the interpretation of de Vaux and is bound to provoke debate among researchers. The reexamination of the caves has led us to a better understanding of the material context in which the manuscripts have been deposited: the natural caves appear more and more cleary to have been hiding places. Finally, new technologies allow a better reading of the manuscripts and offer the possibility of a more faithful reconstruction. The documentary is mainly interested in the roll of psalms 11Q5. the discovery of a new small fragment has given a new start to research and a new plan for publication by the researchers of the École is envisaged.